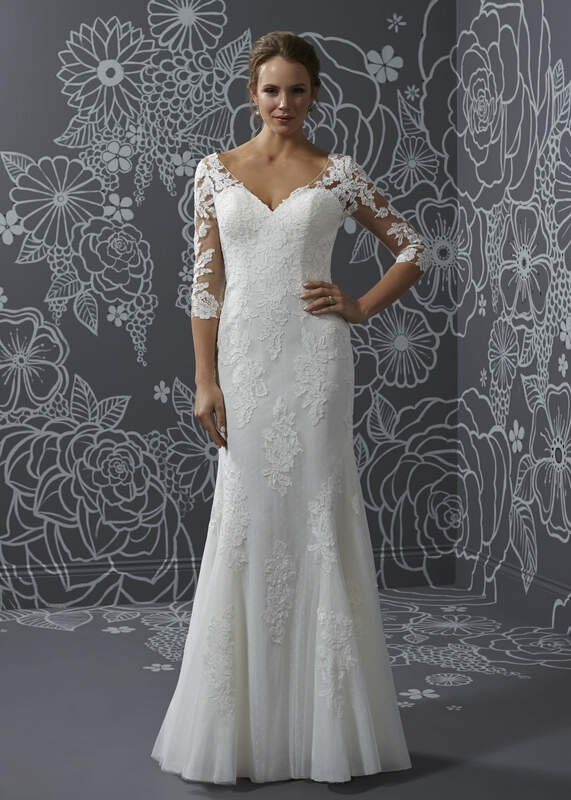 A sophisticated sheath style, with illusion three quarter length sleeves and all over lace detailing. Zip back and buttons. Available in Ivory or White. Photographed in Ivory. 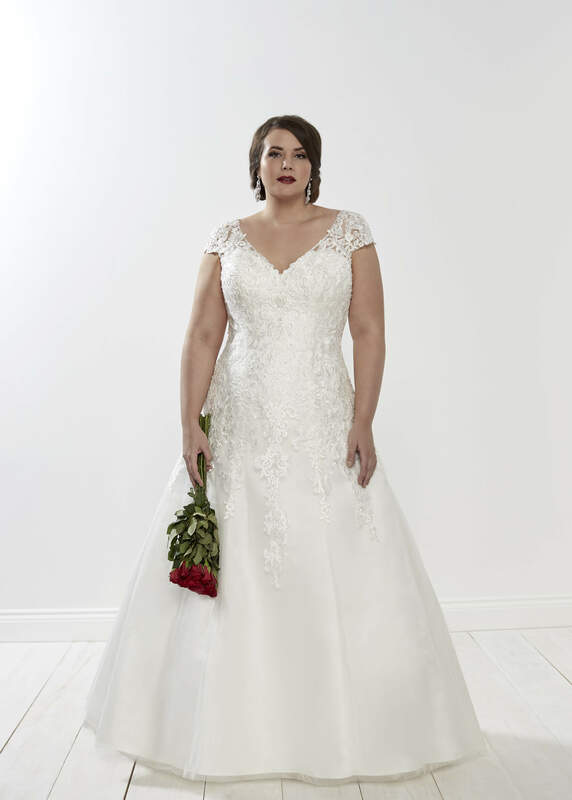 The on trend illusion sleeve of this style, offers a sophisticated twist to an otherwise simple gown. 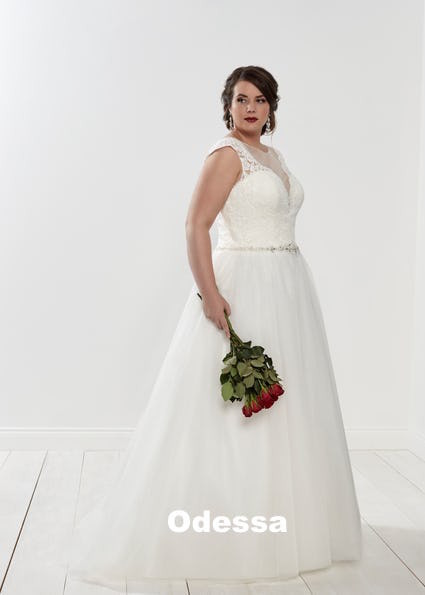 Perfect for a church wedding or for a more modest bride. 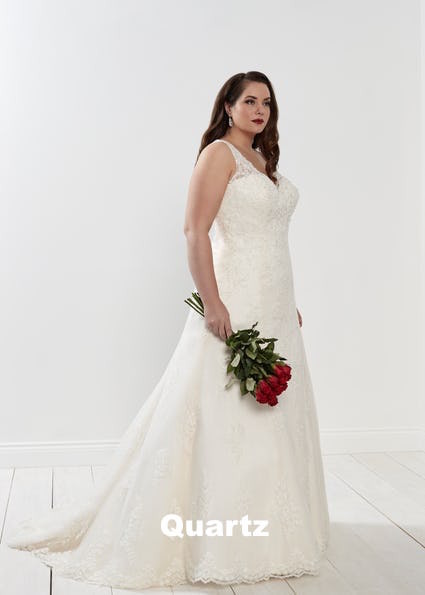 A romantic full A line style, with delicate lace motifs, a scoop neckline and a keyhole illusion back. Tie back. Available in Ivory / Champagne or all Ivory. Photographed in Ivory / Champagne. 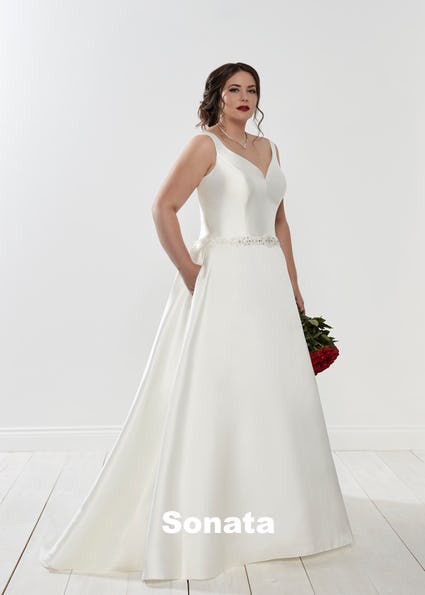 This subtle champagne hue updates a classic silhouette, while the scoop neckline and flared skirt will help create the ideal figure. 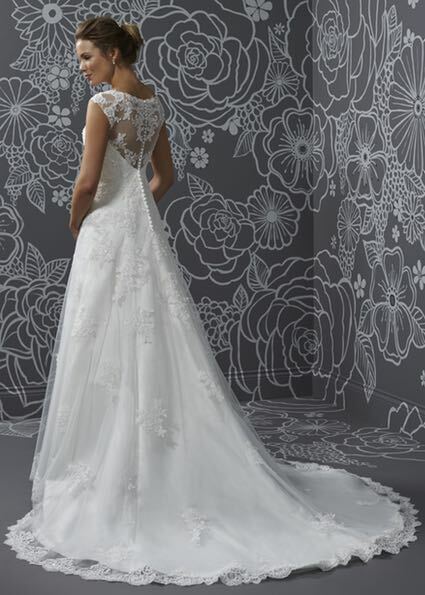 The keyhole back detail adds interest to the traditional lace up back. 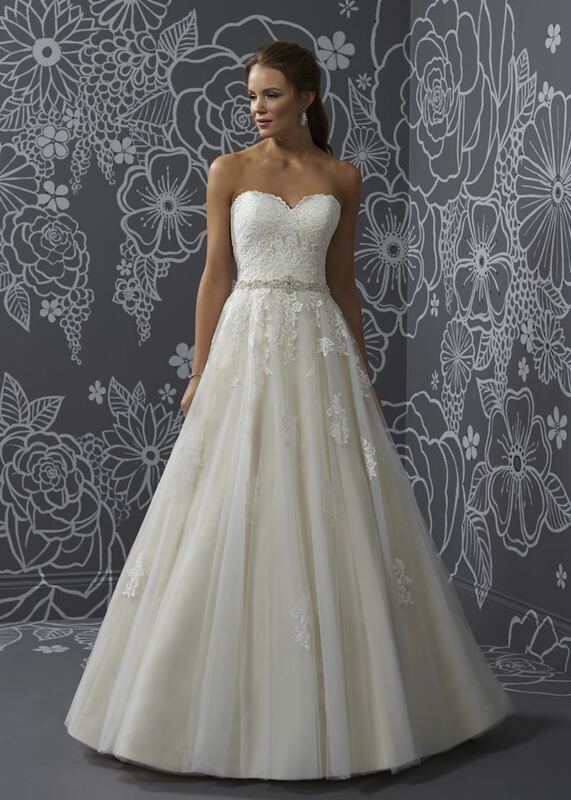 This glamorous fit and flare style is adorned with sparkling lace, a sweetheart neckline and a flowing tulle skirt. Zip back. Available in Ivory or White. Photographed in Ivory. 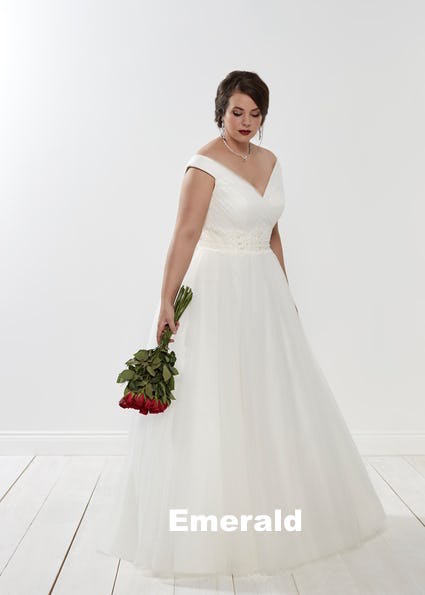 An elegant fit and flare style, updated with a striking almond hue. 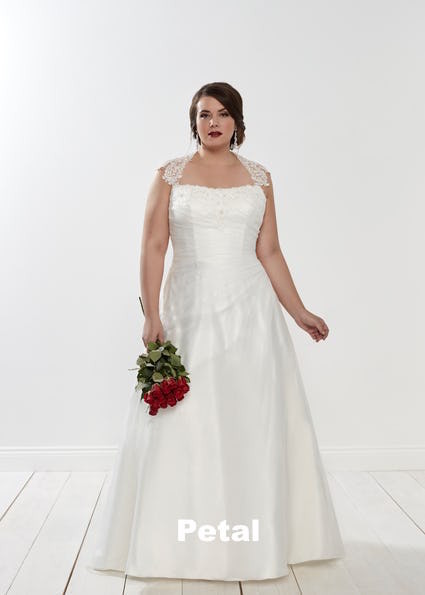 This style features a beautiful V neckline and lace detailing. Zip back and buttons. 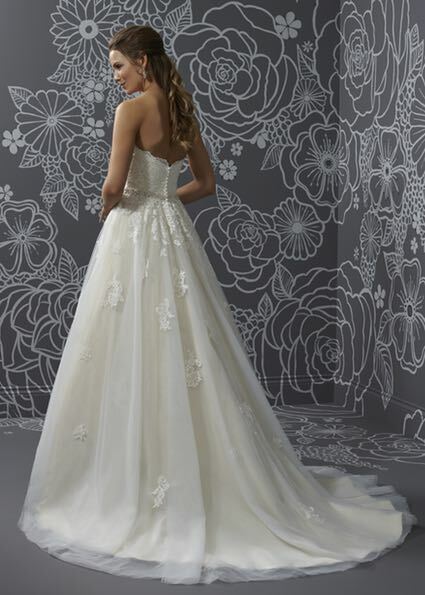 Available in Ivory / Almond / Silver or Ivory / Ivory / Silver. Photographed in Ivory / Almond / Silver. 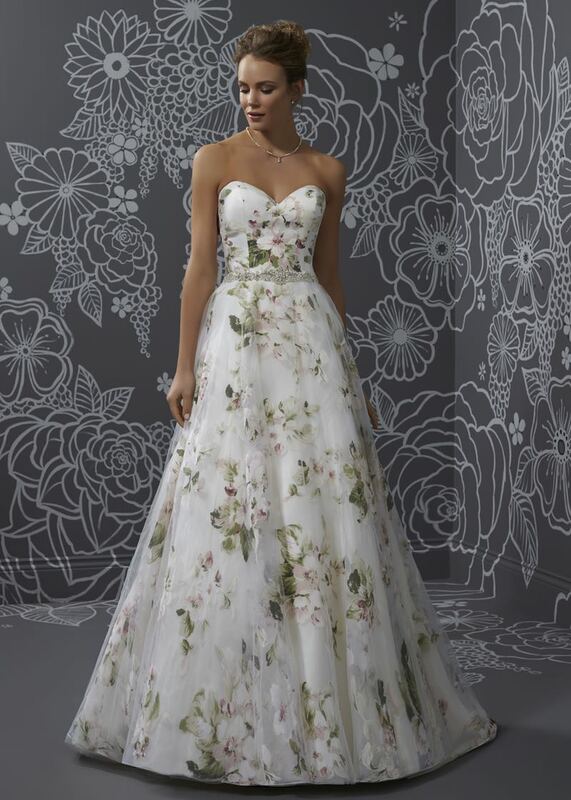 A full A line skirt in a beautiful floral print, with a sweetheart neckline and beaded waist detail. Zip or tie back. 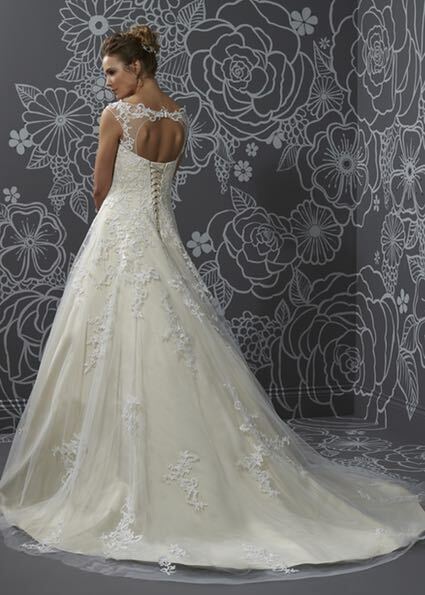 Available in Ivory / Floral only. 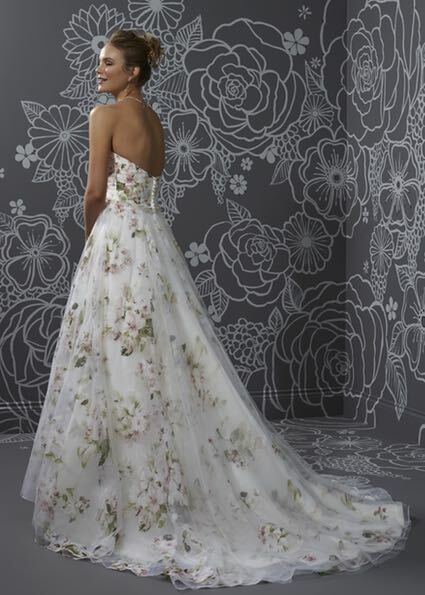 Photographed in Ivory / Floral. 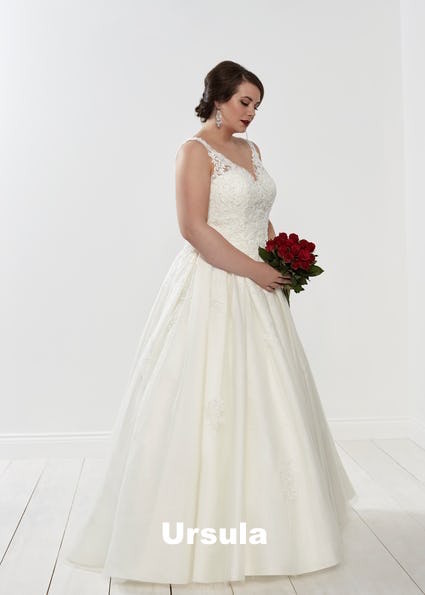 Lily is a truly elegant shape, with sweetheart neckline and flowing full skirt. 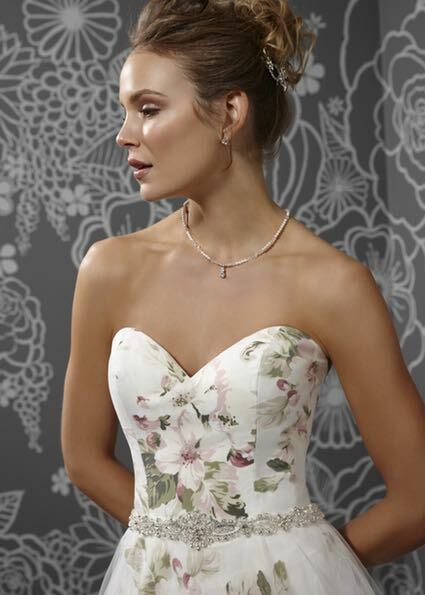 The subtle floral print and hand beaded waist detail, add a touch of romance to this style. 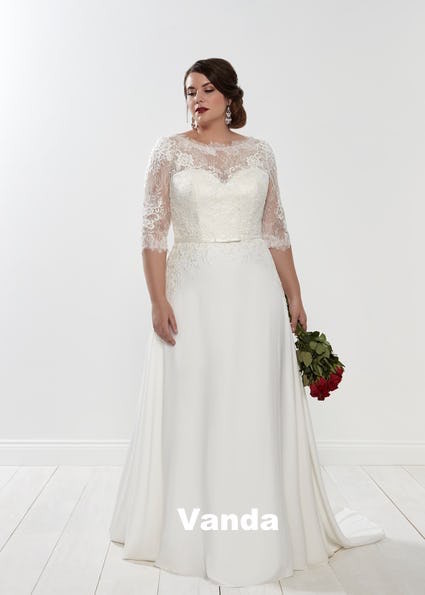 Perfect for the stylish, classic bride. 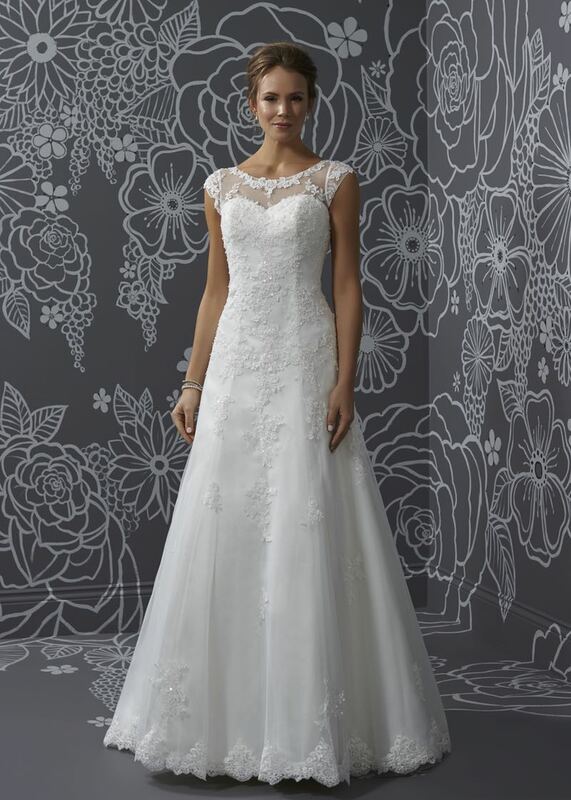 A romantic A line gown with scattered lace motif detailing and sweetheart neckline. Zip back and buttons. Available in Ivory / Light Gold / Ivory or all Ivory. Photographed in Ivory / Light Gold /Ivory. 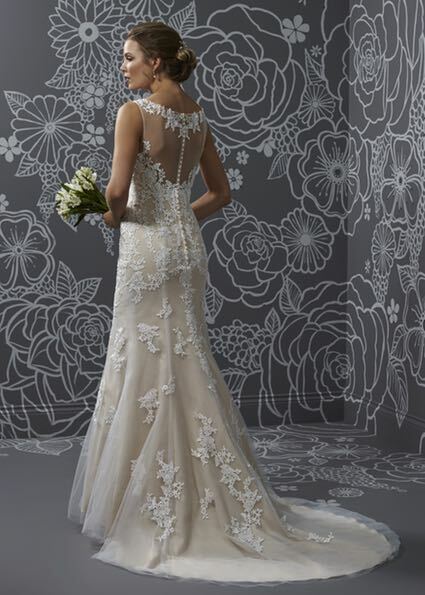 The subtle light gold hue of this style, gives the otherwise traditional silhouette a modern twist. 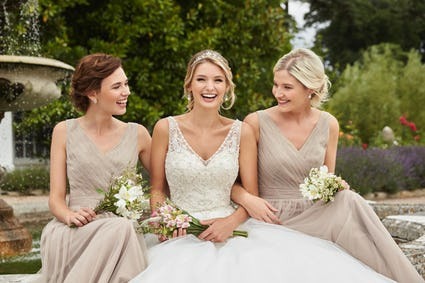 Style with deep toned bridesmaids, for a luxurious bridal look. 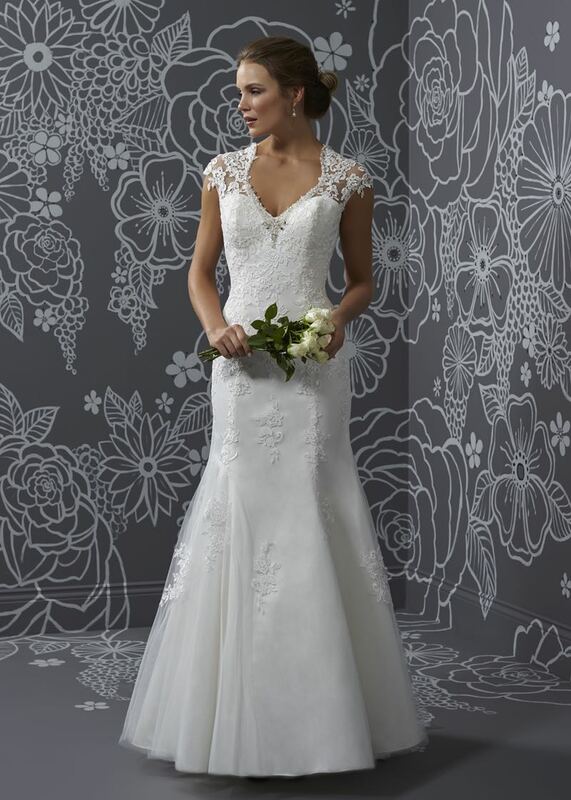 This flattering A line style features beaded lace detailing and illusion capped sleeves. Zip back and buttons. Available in Ivory or White. Photographed in Ivory. 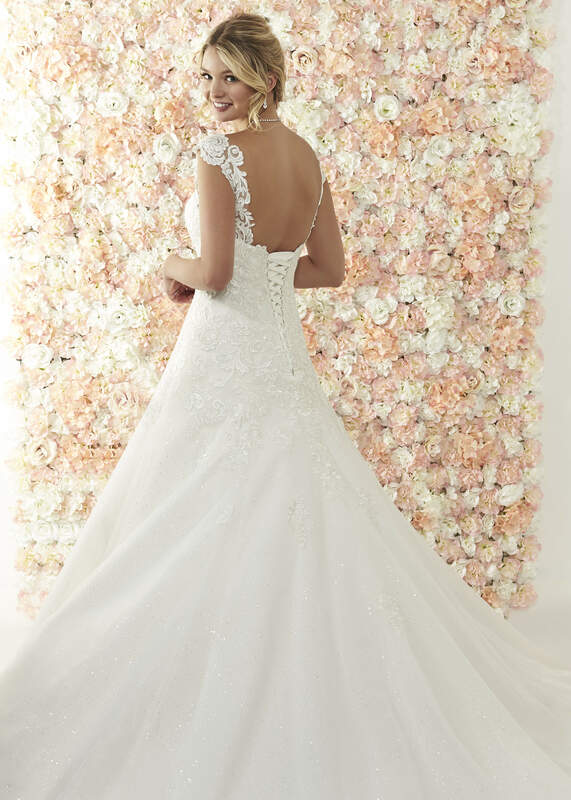 This sophisticated mermaid style features, delicate floral capped sleeves and a stunning double keyhole back. Zip back. Available in Ivory / Silver or White / Silver. Photographed in Ivory / Silver. 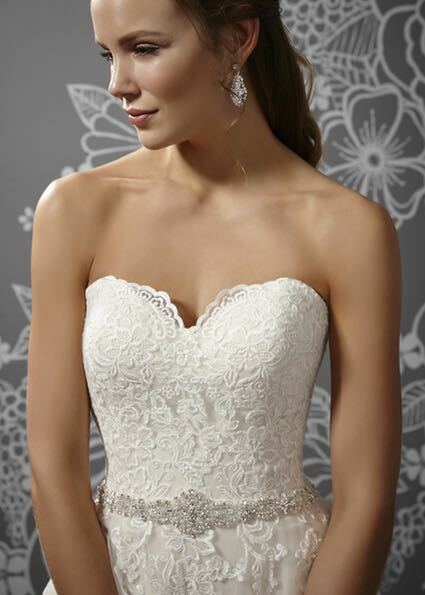 An understated sheath style, with delicately beaded bodice and beautiful full lace illusion back. Zip back and buttons. Available in Ivory / Silver or White / Silver. Photographed in Ivory / Silver. 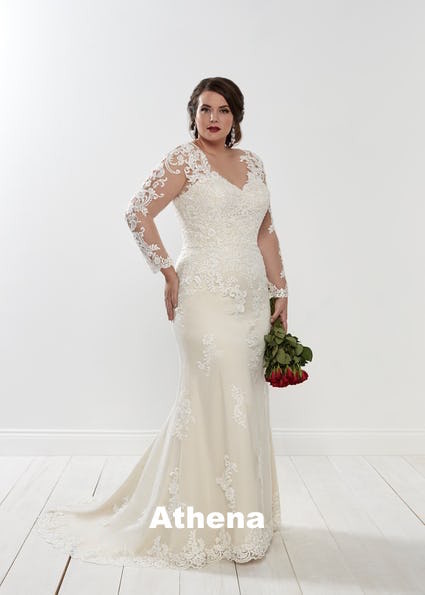 A glamorous fit and flare style, with a plunge neckline, all over lace detailing, sequin under-layer and finished with a low scoop back. **Fastenings**:Zip back and buttons. 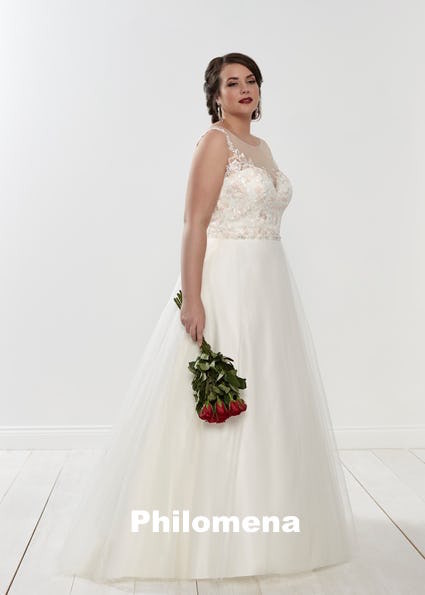 **Available Colours**: Ivory / Vintage Rose or All Ivory. **Photographed in**: Ivory / Vintage Rose. 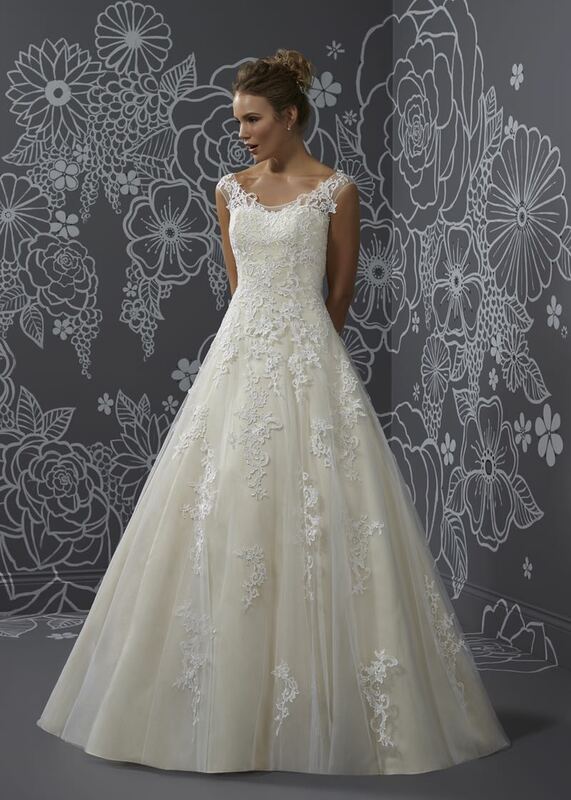 This sensational fit and flare gown, is the perfect choice for a glamorous spring bride. 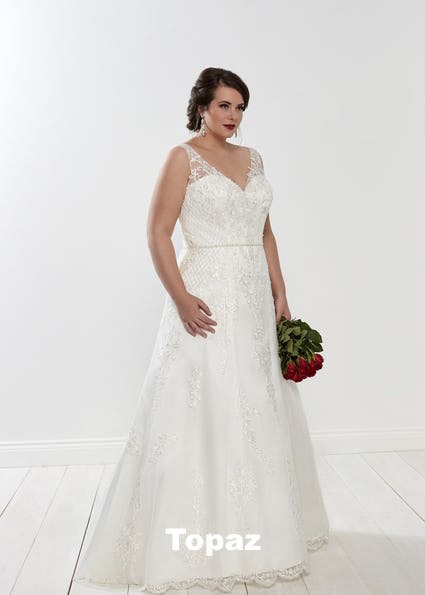 With it's striking plunge neckline, beautiful all over lace, sparkling sequin layer and dramatic scoop back. 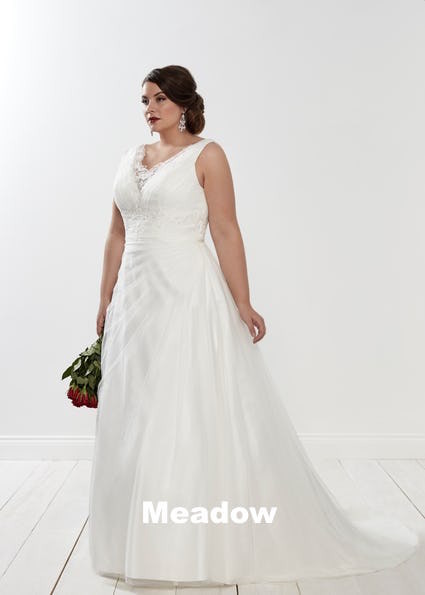 Style with a tousled up do and sparkling jewellery, for a show stopping bridal look. 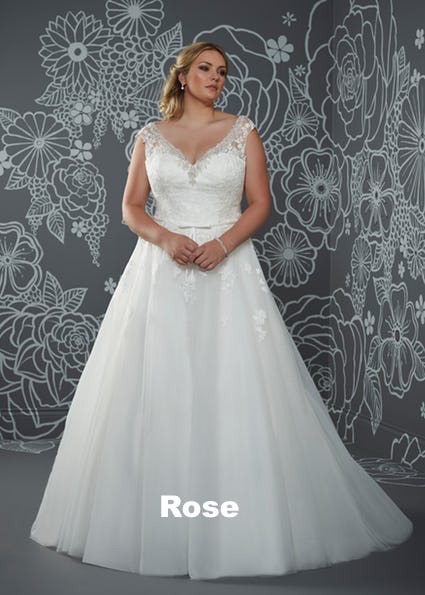 A gorgeous ballgown style, with a deep v neckline, lace bodice, illusion straps, a hand beaded belt, sequin under layer and finished with an illusion keyhole back. **Fastenings**:Zip back and buttons. **Available Colours**: Ivory / Light Gold or All Ivory. **Photographed in**: Ivory / Light Gold. 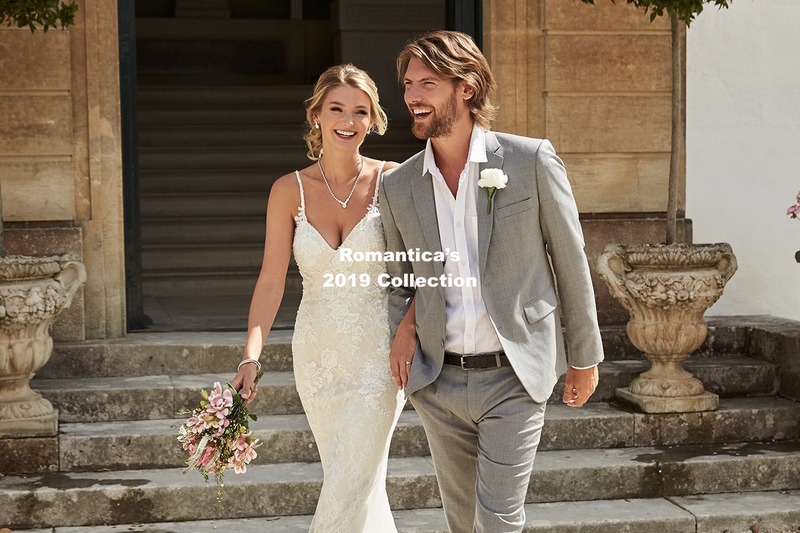 Hannah by Romantica A sophisticated ballgown style, with a v neckline, illusion lace straps, lace bodice, lace motifs. 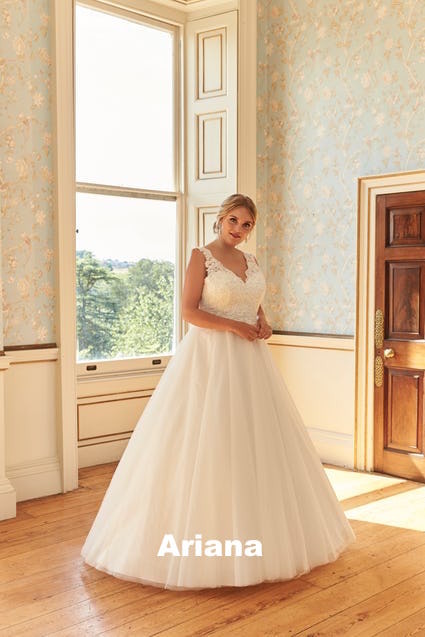 A sophisticated ballgown style, with a v neckline, illusion lace straps, lace bodice, lace motifs and finished with a lace illusion scoop back. **Fastenings**:Zip back and buttons. **Available Colours**: Ivory / Light Rumpink / Silver or All Ivory. **Photographed in**: Ivory / Light Rumpink / Silver. 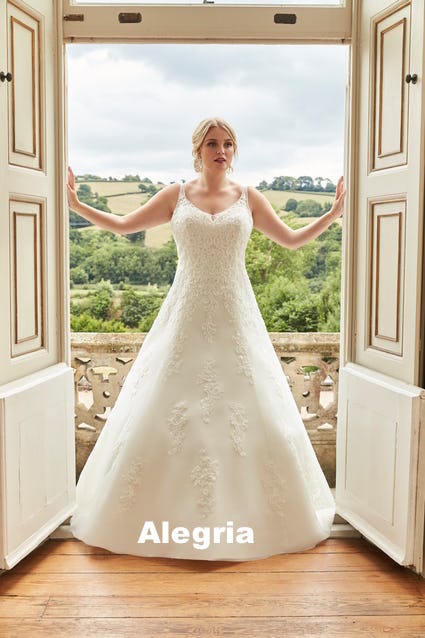 A stunning a line style, with a v neckline, sweetheart bodice, illusion lace shoulder straps, a sequin under-layer and finished with an open back. **Fastenings**:Tie back. **Available Colours**: All Ivory only. **Photographed in**: All Ivory. 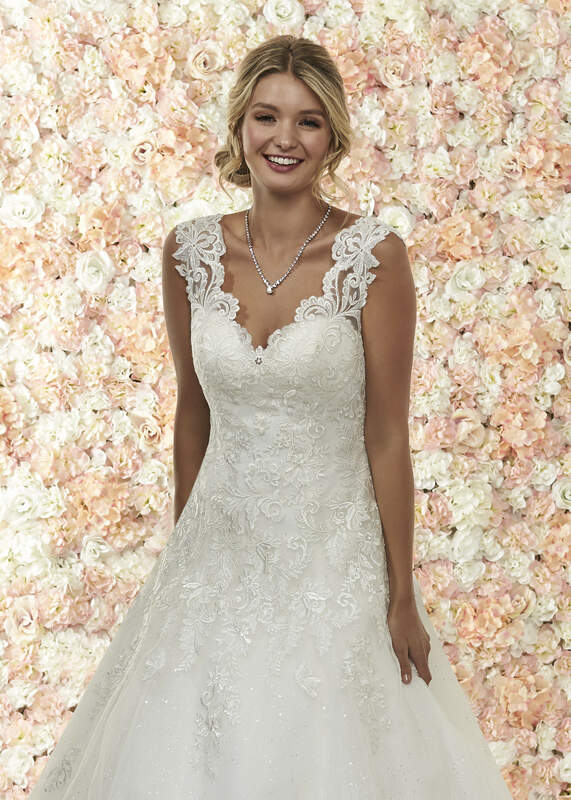 This sensational a line style, is sure to wow your guests with it's flattering v neckline, exquisite lace detailing and sparkling under-layer. 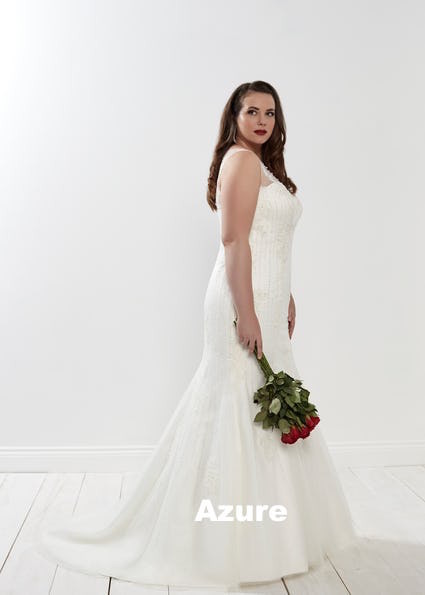 Style with a tousled up do and sparkling jewellery, for an unforgettable bridal look. 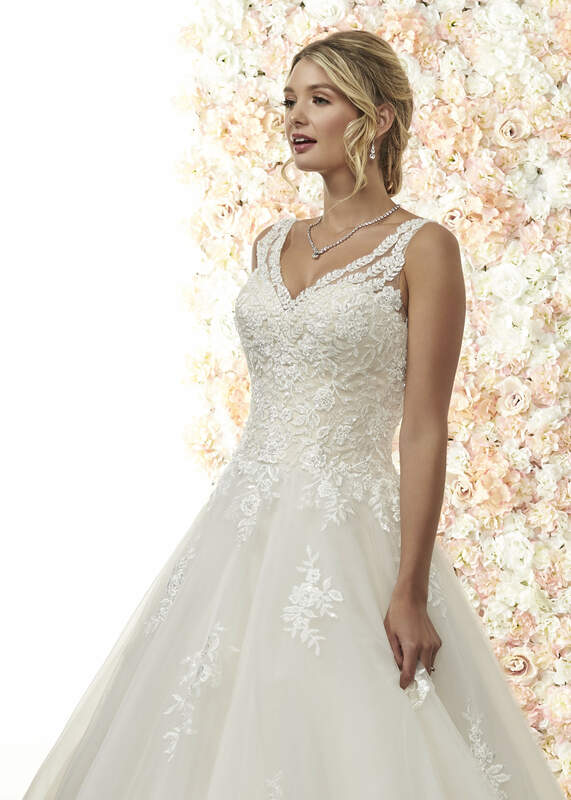 A glamorous mermaid style, with an illusion neckline, sweetheart bodice, all over lace detail, and an open back finished with a detachable lace and hand beaded back detail. **Fastenings**:Zip back and buttons. 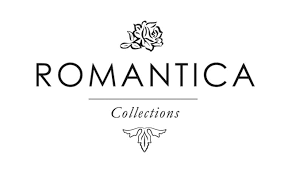 **Available Colours**: Ivory / Bridal Pink / Light Rumpink, Ivory / Silver or All Ivory. **Photographed in**: Ivory / Bridal Pink / Light Rumpink. 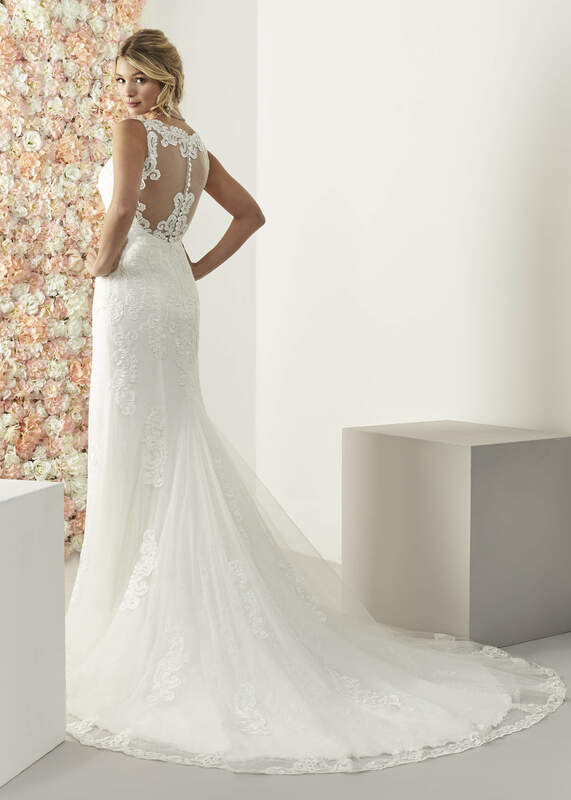 This striking mermaid style, is sure to wow your guests, with it's glamorous silhouette, stunning illusion neckline and gorgeous back detail. 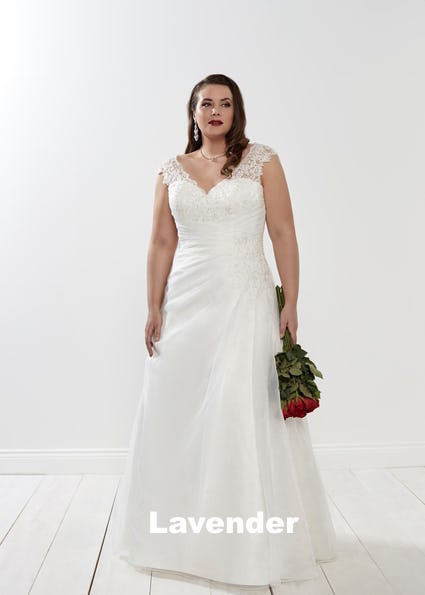 Style with a tousled up do and sparkling jewellery, for a red carpet worthy bridal look. 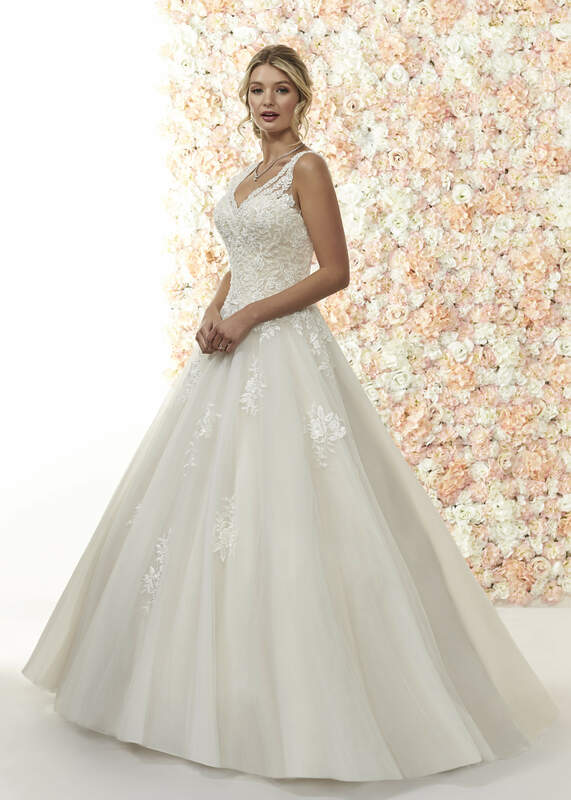 An ethereal a line style, with an illusion neckline, plunge lace bodice, hand beaded detail, full tulle skirt and full illusion back. **Fastenings**:Zip back and buttons. **Available Colours**: Ivory / Light Rumpink / Silver or All Ivory / Silver. **Photographed in**: Ivory / Light Rumpink / Silver. 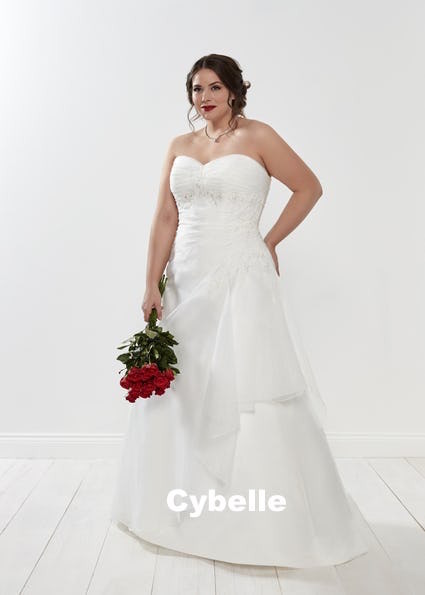 This fairytale a line style, is the perfect choice for a spring / summer wedding. 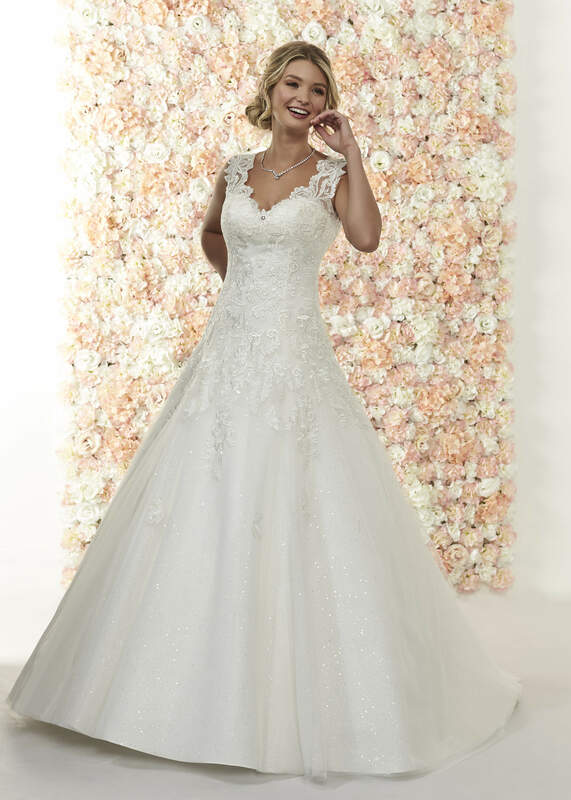 With it's striking illusion neckline, delicate lace bodice, sparkling detail and soft tulle skirt. 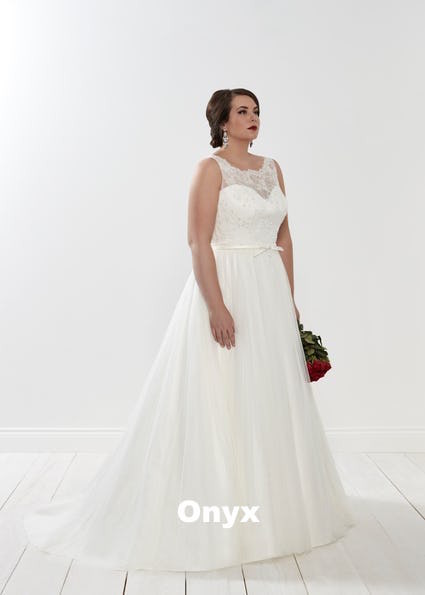 Style with a tousled up do and minimal jewellery, for a dreamy bridal look. 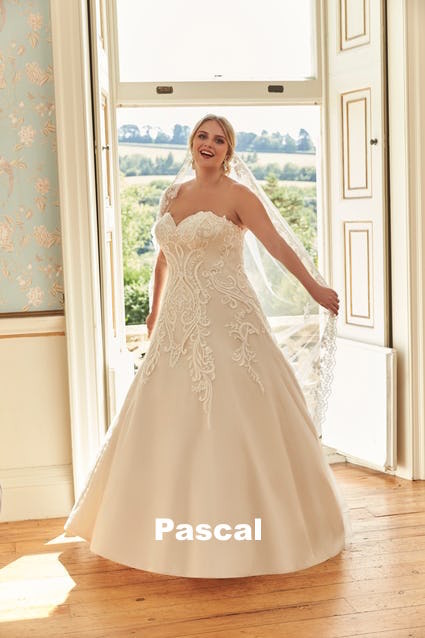 A sophisticated mermaid style, with a v neckline, all over lace detail, illusion lace shoulder straps and finished with a full illusion back and illusion train. **Fastenings**:Zip back and buttons. **Available Colours**: All Ivory only. **Photographed in**: All Ivory. 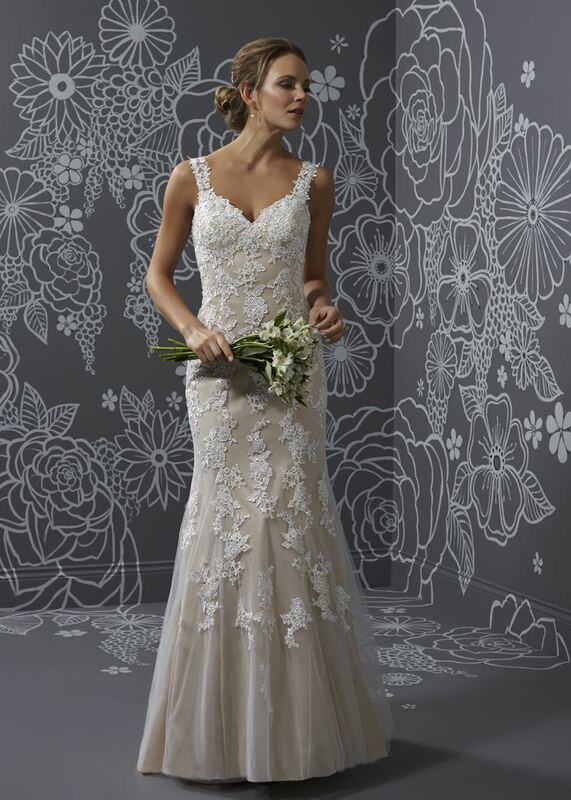 This stunning mermaid style, is the perfect choice for a glamorous bride. 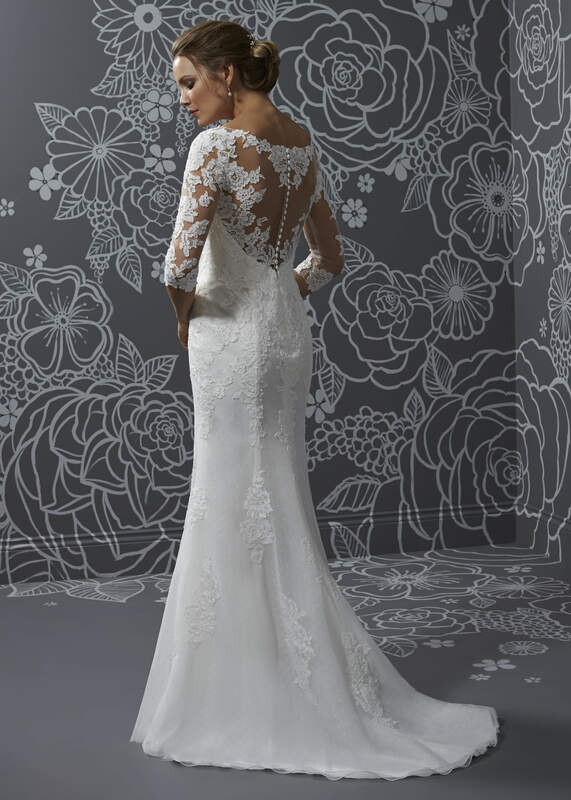 With it's beautiful silhouette, intricate all over lace detail and striking illusion back and train. 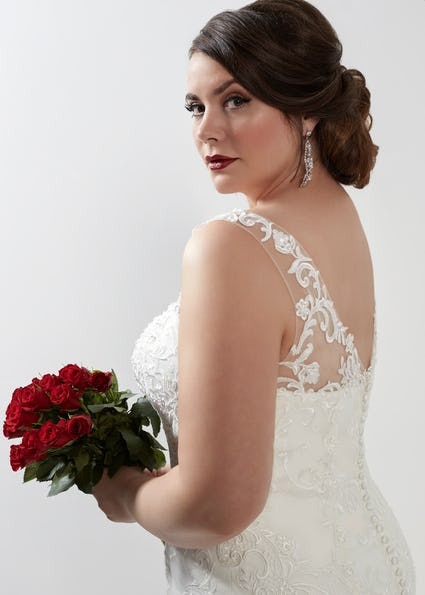 Style with a tousled up do and statement jewellery, for a sensational bridal look. 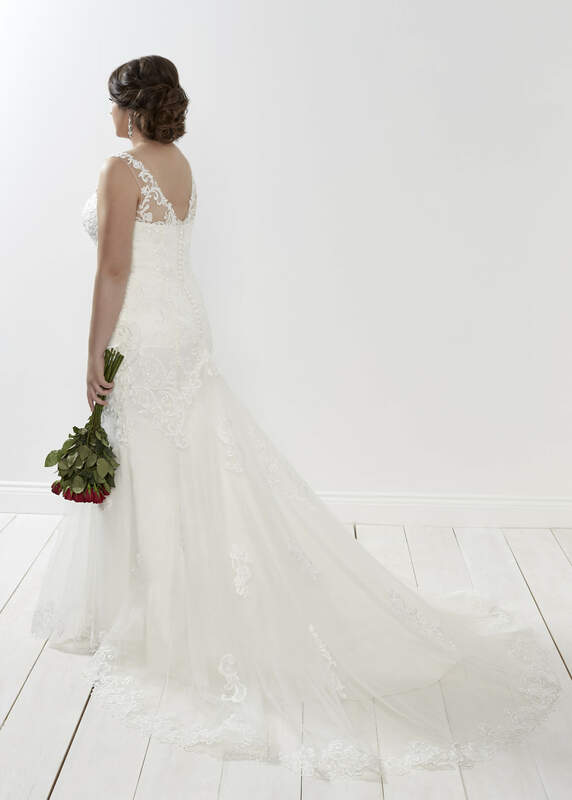 An elegant mermaid style with a v neckline, lace detailing, illusion straps and an illusion train. Zip back and buttons. Available in Ivory / Light Rum Pink or All Ivory. Photographed Ivory / Light Rum Pink. 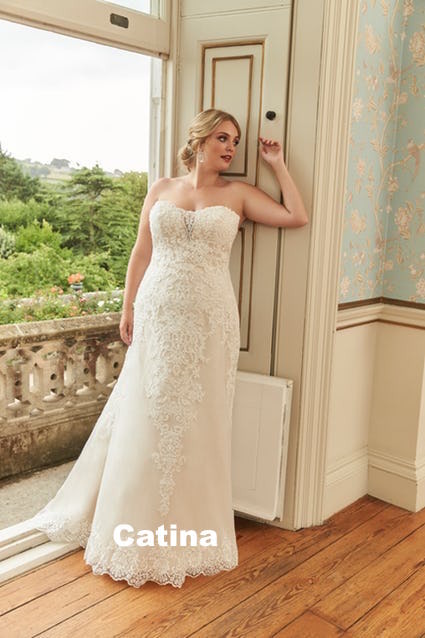 This sophisticated mermaid style is a glamorous choice for any bride, with it's exquisite lace detailing, v neckline and illusion train. 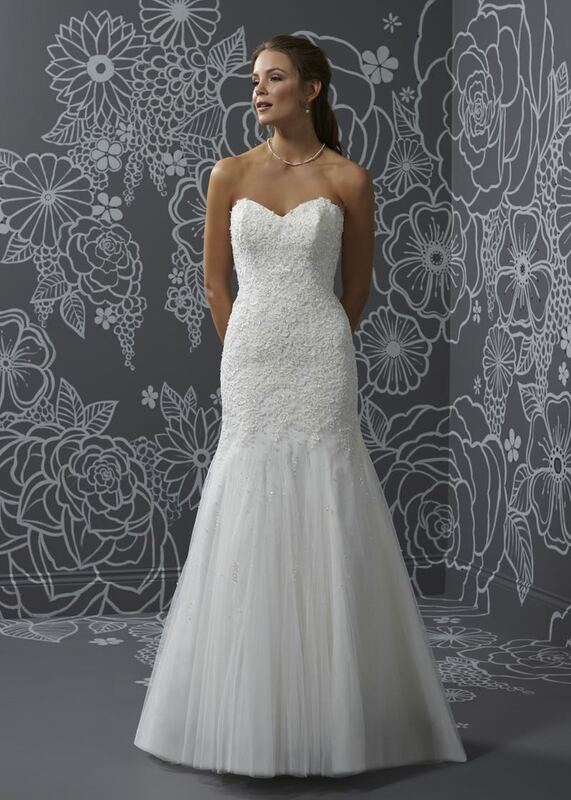 You are sure to wow your guests in our beautiful Opal gown. 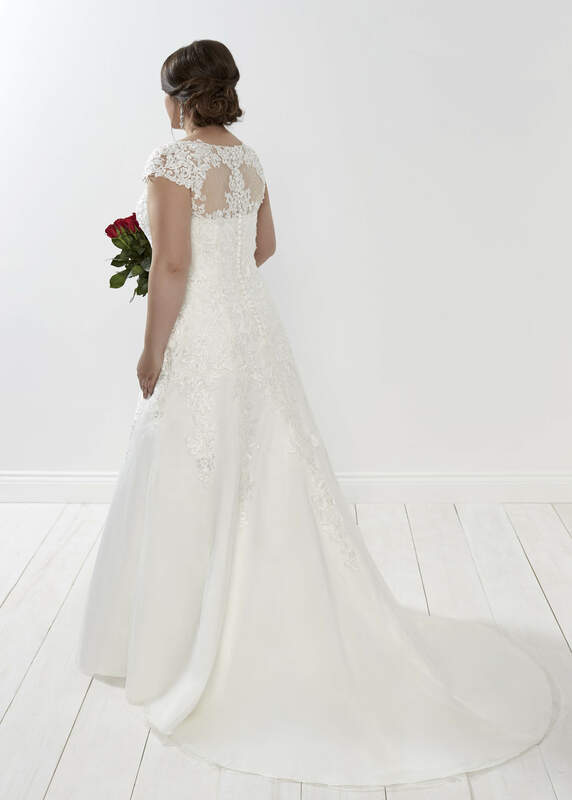 A classic a line style with a v neckline, illusion capped sleeves, an illusion back and lace detailing. Zip back and buttons. Available in Ivory / Silver or White / Silver. Photographed in Ivory / Silver. 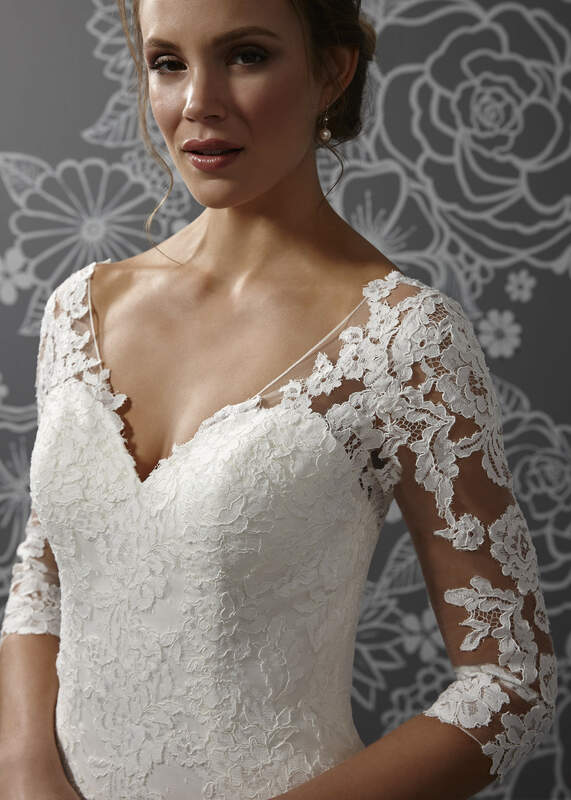 This elegant style is perfect for a traditional wedding with it's exquisite lace detailing and beautiful illusion capped sleeves. 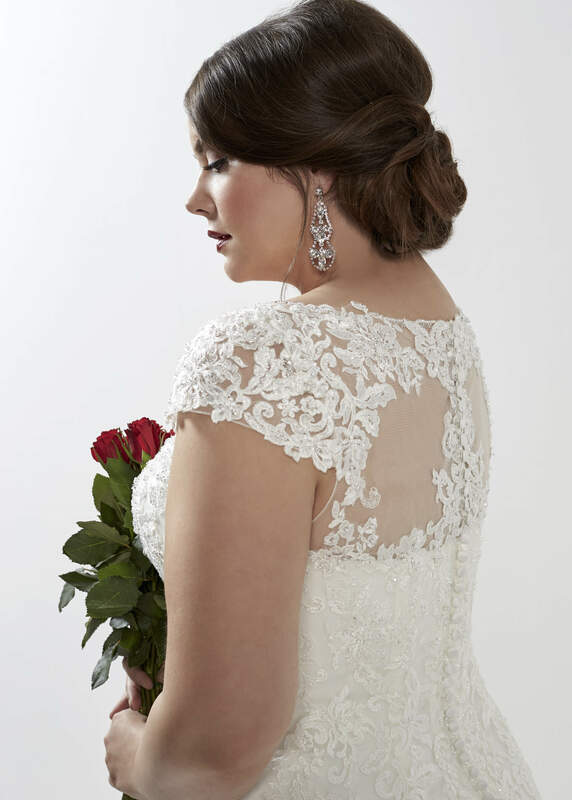 Style with a chic up do and sparkling jewellery for a classic bridal look.